Lidia has established and maintained a portfolio of highly respected strategic partnerships with civic, business, and philanthropic organizations, as well as major universities, to achieve mutual strategic objectives. She works with external stakeholders to ensure that Southwest Airlines maintains a visible leadership position within our community and sets the standard for outreach and corporate social responsibility in Southern California. In addition to her work at Southwest Airlines, she continues to serve her community by being involved in a variety of organizations dedicated to empowering underrepresented communities. 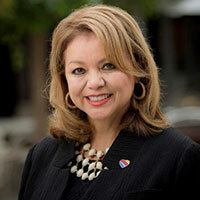 She currently serves on the Board of Directors of the Congressional Hispanic Caucus Institute and the Los Angeles Area Chamber of Commerce; is a Champion for Hispanas Organized for Political Equality and is also on the San Diego State University President’s Latino Advisory Council and the University of California San Diego Chancellor’s Community Advisory Board. She recently finished her Board service to LEAD San Diego and MALDEF. Born in Ciudad Juarez, Chihuahua and raised in El Paso, Texas, Martinez studied at the University of Texas in Arlington where she received a Business Administration degree with a focus in Marketing. She and her husband Ted have two children, Melyna (32) and Teddy (28) and grand-puppy Marley (10). They currently reside in San Diego, CA.